Topic of the program was: The New Indian Woman: How different is she?”. 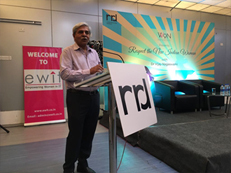 Dr Vijay Nagaswami, Eminent Relationship Consultant, Psychiatrist and Author spoke at the event. The Indian women always had a pre-eminent place in the family and they have been trying to make a mark at the workplace as well. But over the last few years, we find that several stereo types are being broken. Women are taking bolder decisions and are willing to live with the consequences. For instance, women are today not shy of getting into relationships, marrying men who are younger than themselves and perhaps even earning less than them! We see this happening all around us. How does this impact family life and the work place? Dr Nagaswami spoke about the changing perspective of the 21st century woman and how families, near and dear should accept this and move on instead of creating bottlenecks and challenges for them. He answered the volley of questions wielded by the participants.